← News: Online Payment and Scheduling System is Up and Running! If you remember from my post in December 2017 (has it really been three months already? ), I now have my payment and scheduling system set up for mediumship readings. It’s not exactly how I’d like it but it works! Oh, and yes, you should be able to schedule a reading through May 2018 now. I’m happy to report I’ve set up a new link for you to subscribe to my newsletter where you’ll receive the latest news, blog posts and special offers I’m working on. If you follow me on Twitter, you may have heard me tweet about some things I’m working on a few months ago. Hang in there with me! I’m doing a lot of developer work and it’s been a challenge. If you’ve subscribed to be notified of new blog posts prior to today’s date, could you please re-subscribe through the new link right below the Search window where it says “SUBSCRIBE!” Simply click on the “Sign up for my newsletter!” and follow the instructions. I’m using a new tool to help me communicate with you wonderful people and I think this newsletter will work much better than a quick notification that a new blog post has been published. If it all works properly, the new blog posts will be delivered right to your inbox and you can read them at your leisure. As my mind slowly clears, I’ve been able to move forward with my business: baby step by baby step. Far too slowly for me, to be honest, but these last few months, I’m finally feeling capable again. My thanks to all of my followers, new and established, for your patience and understanding as I slowly emerge from my chrysalis of grief and venture into a new reality where Hank’s physicalness is so greatly absent yet I know he is still loving and supporting me and our son each and every day. A year and three months later, I’m just beginning to open myself up to sensing him on the Other Side. I keep telling him to bear with me as my heart wrestles with my mind in acknowledging his passing. For those of you who are at this stage in your grief, I’m right there with you. Be patient and kind to yourself. Give yourself time and lots of love. Your loved ones on the Other Side are with you every step of the way. 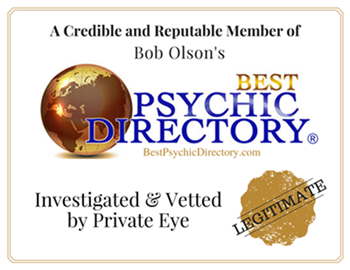 This entry was posted in Intuition, mediumship, News, spirituality and tagged gratitude, grief, healing, intuition, love, mediumship, newsletter, online payments, readings. Bookmark the permalink.